Our new Kickstarter project, Colouring Paradise: a Renaissance-Inspired Colouring Book, launched yesterday, and today we thought we’d give you a closer look at the three drawings that are available as single images. They all appeared in Issue 1 of Pulp Literature, and even though they are some of Mel Anastasiou’s earliest published work they are remarkable in their detail and feeling. Deep in the magic forest, a magpie rules all she surveys. This drawing is one of the first instances of Mel’s signature, rope-like, tangled trees. 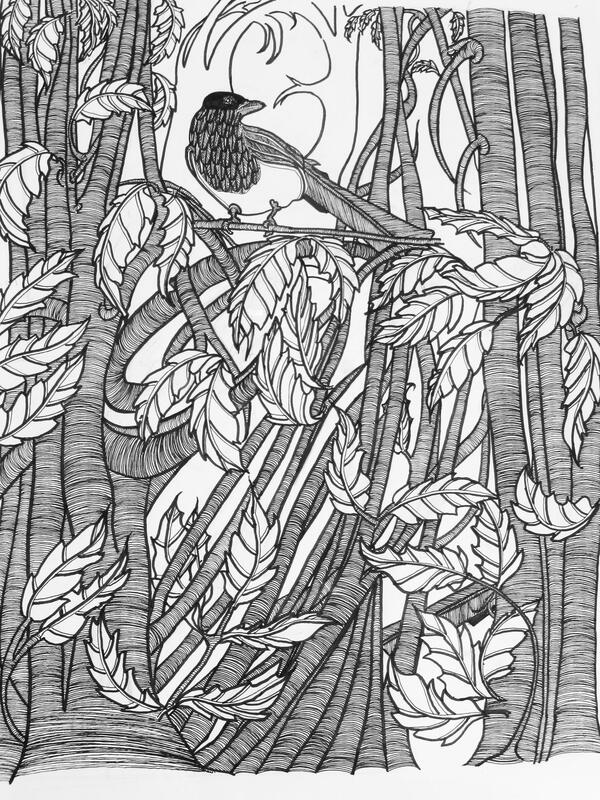 The magpie at first seems caged by the forest, until you realize she might fly away at any moment into the clearing behind her. The orginal drawing now lives in Australia, feeling regal amid her short-tailed down-under cousins. Michael holds the world up for review. When CC Humphrey‘s story ‘Where the Angels Wait’ came to us, we knew Michael was the perfect angel for its title page. 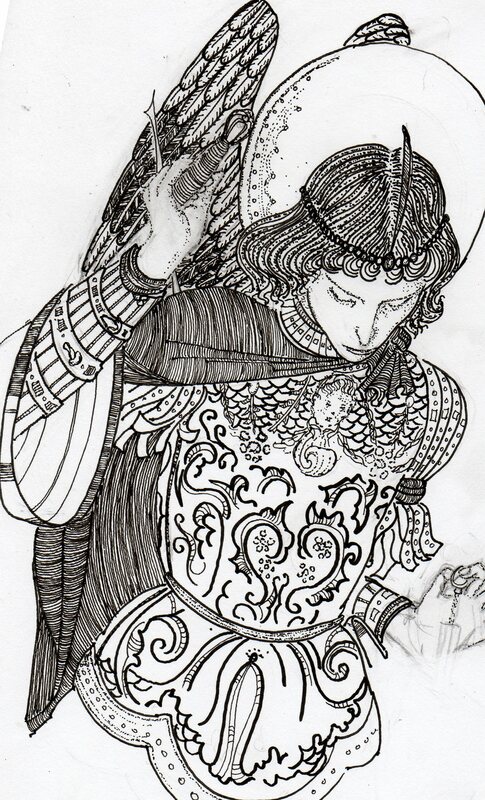 Here’s a peek at the work in progress, before Mel added the globe to this drawing in the style of Carlo Crivelli. You can already see Mel has captured the delicate hands, nose and mouth typical of the 15th century painter’s work. After Paolo Veronese; Veronica is lost in the woods with only her shining jewels and silks to light the darkness around her. This drawing first appeared as an incidental illustration in Issue 1. In Issue 2, she reappeared in a plain white dress to accompany David Clink’s poem, ‘The Lady in White’. 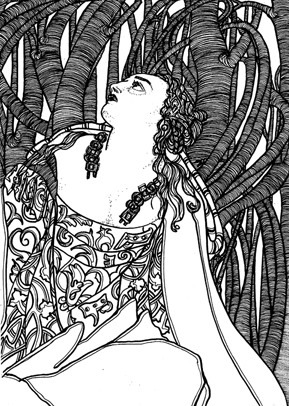 Here she is, with her intricate dress restored for your colouring pleasure. These three images are on offer as high-resolution pdfs on the Kickstarter page for only $2 each, or $5 for all three. This is nowhere near what the intricate works are worth, but Mel is very generously offering them for those just dipping their toes into the colouring craze. And if three’s not enough, you can get the entire book for $10 as a pdf, or $20 in print. We are a registered non-profit organization, and once we have covered our production and shipping costs, all remaining funds to paying artists and authors. Please consider backing us on Kickstarter: this colouring book project will help keep Pulp Literature, and the stories and artwork you’ve come to love, alive!